Getting the right consistency and balance of cake versus fudge in a good batch of brownies is not only tricky but imperative for making them delicious and family friendly. 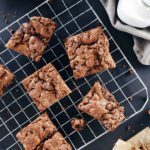 Further, making your brownies Paleo friendly AND edible to the general population may be a tall order (I know that’s what you’re thinking), but I’m up for the challenge, and these Paleo chocolate chip fudge brownies are the best you will have ever tasted! We have tried several paleo brownie recipes before and most of them were dry and didn’t really taste like a “real” brownie. Paleo brownies tend to have a pretty bland consistency and flavor. Not these paleo brownies. 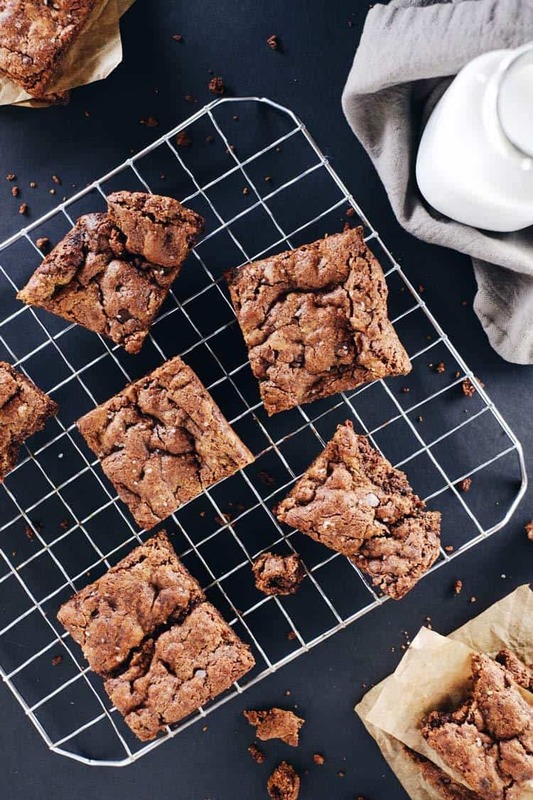 The best thing we can say about these paleo brownies is – they don’t taste like paleo brownies! They have the right consistency and have the chewy consistency you want when you sink your teeth into a brownie. Not only are these better than any other paleo brownie out there, you can even dress them up with our paleo vanilla ice cream for a full on paleo-friendly dessert. 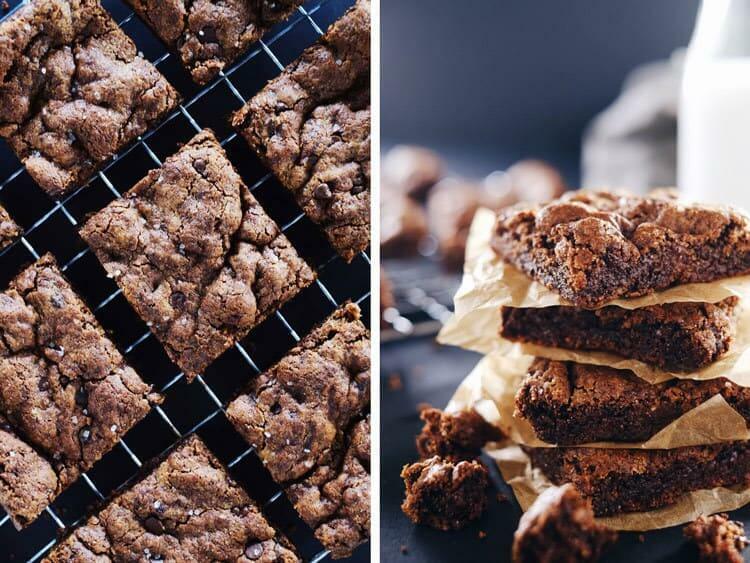 Serve these paleo chocolate chip fudge brownies up! They’ll be a hit with your whole family! Let us know how it goes by leaving a comment below. Take a photo and tag us on Instagram @realsimplegood, so we can check it out! Preheat your oven to 350 degrees, and line a 9"x9" baking pan with parchment paper. In a large mixing bowl, whisk your egg. Add your nut butter and coconut sugar (or maple sugar), and mix to combine. Next, and your cocoa powder. It's easiest if you do it a little at a time as it gets harder and harder to combine. Add the rest of the ingredients (chocolate chips, vanilla, baking soda, and salt). Mix up until it's all incorporated. Depending on how firm or oily your nut butter was you may have to pull your sleeves up and use your hands to finish combining all of the ingredients. Dump your mixture into your parchment lined pan and spread out with your hands. I sprinkled a little salt on top, but that's optional. Cook your brownies in the oven at 350 degrees for 14-16 minutes. The brownies will rise quite a bit in the oven and they'll be just a little squishy when they're ready, slightly underdone looking. That's what you want! Allow them to fully cool (THIS IS IMPORTANT) or they won't stay together for you. These look amazing!! I’ve never heard of sunflower seed butter… is there a reason you’ve used this instead of another ingredient? These brownies have quickly become my favorite paleo treat. For my second batch, I made them with honey sunflower butter (because that’s what I had on hand) and they were quickly devoured by my entire family. I had to hide a few for myself. Thank you, thank you for this delicious recipe! This was a super yummy dessert that lasted about 2.4 seconds. Thanks for sharing!